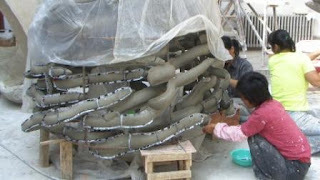 Sam Ludden Ceramics : Finally - An Update on the Hinaki Sculpture! Finally - An Update on the Hinaki Sculpture! 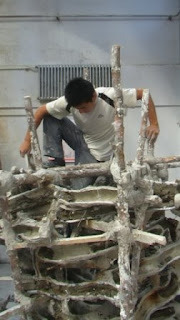 The moulders prepare the clay form for the application of plaster of paris. Applying the plaster of paris. 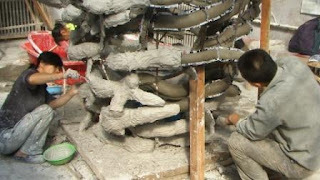 The difficulty with the mould became one of fragility where one wrong move would turn whole sections of eels into dust. Climbing in and out of the sculpture was frought with danger! As the team realised how much work lay ahead to get the sculpture finished it was all hands on deck. Janine and I jumped in to help the moulders where we could but the long days I was doing were nothing compared to what they did for us. These folks worked 24/7 in the final days to get the sculpture finished. We were absolutely and totally humbled by what they were prepared to do for us, which was way beyond the call of duty. These photos speak a thousand words.....thank-you, thank-you, thank-you! And yes, we did some work too! Strutting our dusty selves at the end of a long morning...this photo was taken after a night with no sleep and an hour before we had to be at the official opening ceremony! I was so impressed with your sculpture. I think it was the best there out of all the works.Sure it was not finished but when it is,man! it will be unreal. I think you have the bones to be a great artist. I think Changchun was your baptism of fire. Go Bro!